Was your supply chain impacted by hurricanes Harvey and Irma? It was for thousands of businesses as ports and highways literally shut down for a time. Such events are a tragic reminder that shippers must proactively prepare for supply chain disruptions to minimize lost revenue and customer confidence. In its 2016 Supply Chain Resilience Report, the UK-based Business Continuity Institute summarized the results of its survey of 526 large companies. About 70% of companies said they had experienced at least one major supply chain disruption during the previous 12 months. As for the cost of those disruptions, 34% of respondents reported cumulative losses of more than 1 million Euros, with a small number reporting losses in the hundreds of millions. When goods don’t move, raw materials don’t get to factories and production stops; finished goods are delayed at the port on the way to distribution centers; and missed retail deliveries mean empty store shelves and lost sales. Just as individuals should prepare for emergencies to protect themselves and their loved ones, shippers must protect their operations by planning in advance for supply chain disruptions. Of course, some of these are inter-related, such as when a cyber-attack on shipping giant A.P. Moller-Maersk led to major transport network disruptions. Whatever the cause, the event does not have to impact your business directly to have devastating effects. For instance, if you are a manufacturer, problems at Tier 1 or Tier 2 suppliers can halt production, shatter shareholder confidence and cause stock prices to tumble. Are you set up to get advance warning of such problems in order to create a contingency plan? 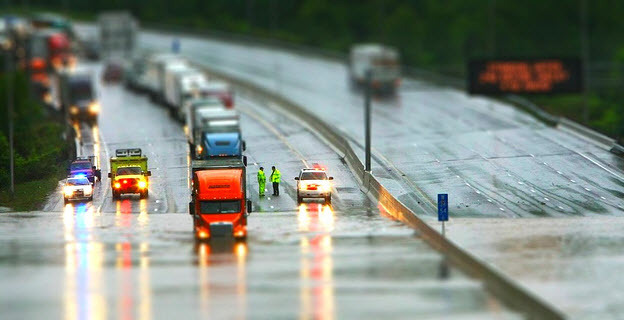 In the logistics realm, weather-related disruptions are what we deal with the most. In this regard, we can compare ourselves to Florida businesses. The ones that are unprepared flood Home Depot and Lowe’s the day before a storm to buy wood and nails to shutter up their windows, while the well-prepared businesses simply pull down the storm shutters that they installed years ago. Advanced planning is the key with supply chain disruptions. You don’t want to be thinking about contingency plans on the eve of a weather disaster. Logistics people will always focus on operational execution during a disaster, as they should. But it’s extremely important to keep stakeholders informed during the emergency. So as you develop your operational contingency plans, think too about how you are going to communicate with customers and supply chain partners to manage their expectations. Leading 3PLs provide integrated logistics services for many companies simultaneously. With this comes great responsibility, so they tend to prioritize contingency planning. But that’s not a universal trait. As part of your planning, get with your strategic 3PLs and discuss what happens if…. Disasters that impact your supply chain don’t happen often, but when they do they can cost your company millions of dollars – within a matter of hours. Because there is so much at stake, it’s critical that logistics professionals occasionally pull themselves away from the firefighting of day-to-day operations and make time for contingency planning. The worst time to be strategizing on disaster preparedness is right before the disaster hits.